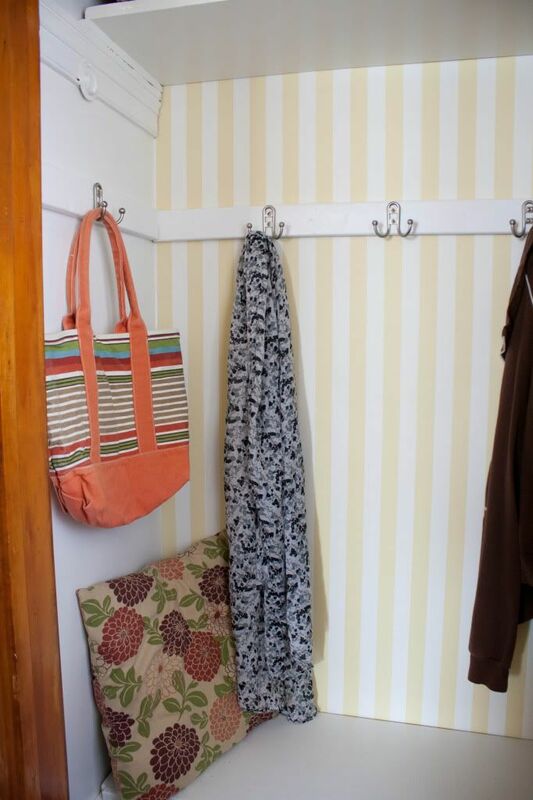 If you've been reading for awhile, you may wonder why we just updated our entryway corner (with new coat hooks and a key holder) when we have a little mudroom closet by the back door. Well, two years after turning that little closet into a mudroom, we had never really used it. Sure we hung winter coats there during the summer. And I stashed a box of outdoor toys under the bench. But that was it. Our everyday shoes and jackets still landed by the front door. We finally realized there was no point trying to make that closet be something that just didn't fit for us. 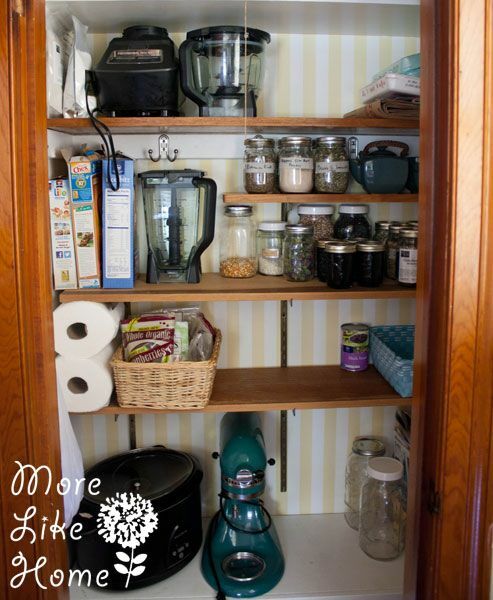 So we switched it up again, but still not into a coat closet - we made a pantry! I call it Pantry Junior. Because it's the younger pantry. It keeps Husband in a healthy state of confusion since Pantry Senior is actually a much smaller pantry (and therefore more fitting to the Jr. name). 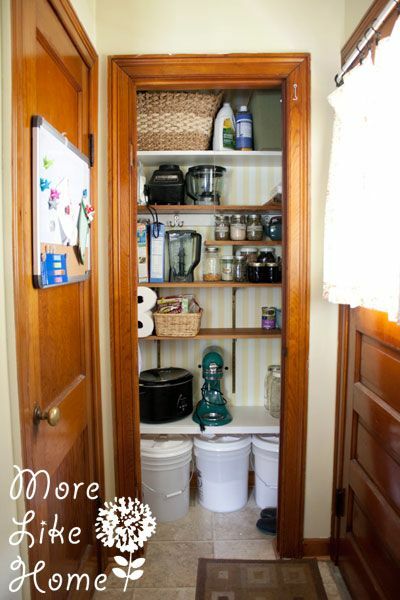 The mudroom-to-pantry conversion was actually pretty simple. We ended up leaving the coat hooks in case we change our minds again later (we actually used the boards they are attached to as supports for a new pantry shelf) and the bench worked perfectly as a bottom shelf with room under it for a few gamma seal buckets that hold bulk foods. And above that? We added more of the adjustable shelving we got for $2 at a yard sale (we also put some in the garage and the master closet). The adjustable brackets will give us plenty of room to move things around if we need to. Plus the original wood color worked well with the white and yellow so we didn't need to paint! We did a few varying heights for now to accommodate as many different sized items as possible. We moved in a few things and I was all "where were we keeping all this stuff before?!" Some of it had been on the counter, some crammed in corners of cupboards, and some had been in the basement. It's so much more convenient having it all here within reach and easy to find. 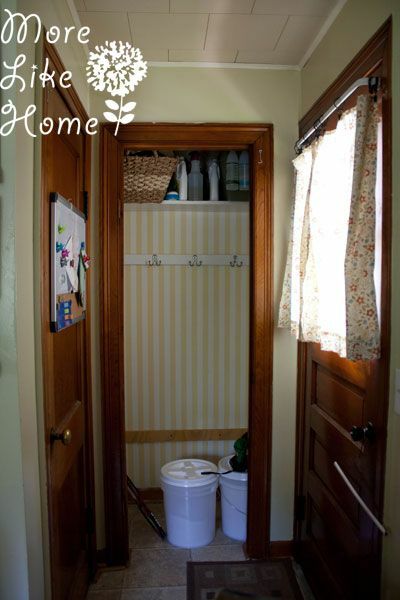 We have room for extra paper towels (instead of having to run to the basement every time we run out) and a basket for nuts and dried fruit (which is raided regularly by two small boys). The bottom shelf (which used to be the bench) is plenty strong to hold large items like our crockpot and stand mixer. And our bulk food buckets tuck perfectly underneath (we use these buckets and these lids). Plus a pair of mud boots in the corner for running things out to the composter. The smaller shelves hold jellies (made by my grandma, the best you'll ever taste! ), herbs, teas, beans, rice, and popcorn. 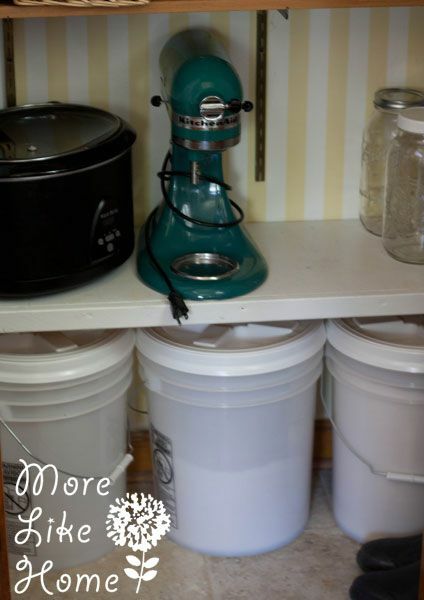 There's also plenty of space for our blender and mixer. And we still have room to spare! We've had it in place about 6 months now and it's been working great! It's a little fuller than the pictures, but we still have extra space. It feels a bit like overkill to have two pantries (we have a smaller one by the fridge) but the space is actually being used several times per day, so I guess it's still an improvement! 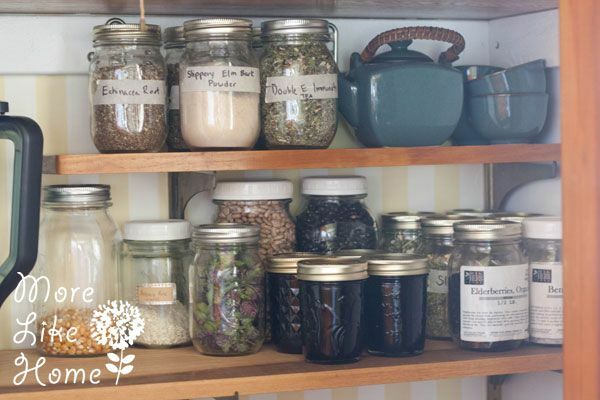 Do you have a pantry? 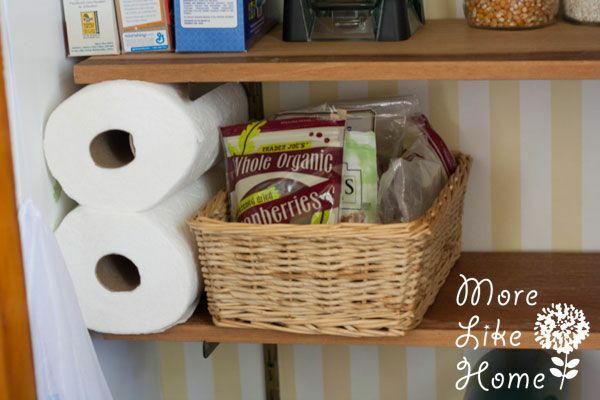 What's is your favorite way to keep it organized?